The air was cold and crisp as I woke up this morning. For the first time this fall the mud puddles were frozen and I had to work at scrapping the frost off my truck window. The orange-red tinged leaves on the maple tree in my front yard were glistening as the rising sun cast its light over them. It was an incredible fall morning and I couldn’t help but smile as I drove into work. Even my stop at Tim Hortons seemed special this morning, even though nothing exciting happened. The sausage and egg sandwich tasted good and the tea was awakening as usual. I read the paper and was glad to see nothing bad had really happened in Kings County over night. It is actually comforting to know that this is quite often the case. I acknowledge and say “Hello” to a number of people who come in to get their morning fix as well. I head over to the office looking forward to doing stream surveys. I sit down at my desk, prop open my lap top and turn it on. It has 17 updates to run. Crap! Now I have to wait for close to an hour before I can check my emails, send out an important one, and then head to the field. Ahhhhh. Eventually though my colleague and I are heading to a small stream with a deep valley and I am once again smiling as I park the truck along the road side. As I hop out, I notice the temperature on the truck mirror reads -1◦ C. This causes me to shiver as I put on my chest waders and don my orange vest. The weather man was stating there was a slight chance of flurries in the afternoon and at that point I thought he might hit the mark. I walk off the road following an ATV trail down the stream valley to a point where we had previously left off. Suddenly it hit me. The smell of the woods crashed through my nostrils and I stopped for a second to rein it in. The odor of the musty, decaying leaves, the moist heavy mosses, and wet, rotting wood were all racing franticly in the cold air simply looking for a place to get warm. I was glad to be back to this stream as I had really enjoyed our previous survey of the upper half. It was a relatively intact ecosystem with a well maintained forest. ATV trails, some historic logging, and recent select cuts were really the only noticeable human impacts. We had completed most of the steeper portion of the stream and were now heading to a flatter stretch to work towards a beaver dam where we would end our assessment for this stream. I stop to photograph a small run-off stream that was running due to the recent rains we had had. 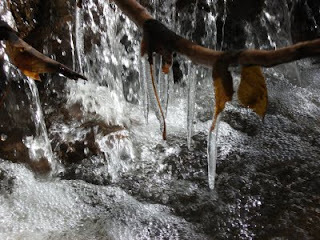 It is a small channel of water that appeared as if it was actually flowing over and through the leaves. Even this small little run-off was impressive and I wondered how many people would appreciate the contribution it made to this steep hillside ecosystem. We arrive at the first reach that we intend to assess and pull out our gear. As we start working our way down the stream channel it doesn’t even feel like work. The sun shining through the remaining leaves of the maples and birches warmed us not physically but spiritually. The health of the stream ecosystem was almost natural as we continue down the valley. Eventually we reached a tributary coming in on the right bank. We took some measurements and notes then glanced upstream. 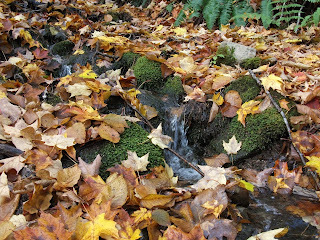 We were very surprised to find a great, tranquil, moss covered, waterfall. It was so idyllic that it felt very surreal. 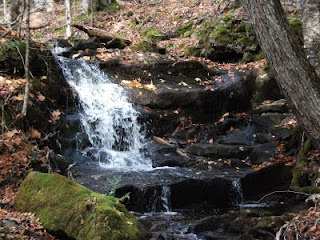 We took time to explore the falls and the small stream that created them. It was at this point that we noticed a large clear cut nearby. It actually encroached well within the 30m buffer strip that logging operations are supposed to maintain. We finished our assessment that day near a beaver dam and my colleague and I both felt a bit disheartened but more determined than ever to continue our efforts to improve the aquatic and riparian habitats within the Kennebecasis River.